From Malmö, Gothenburg City, Oslo, Karlstad: Drive E20 direction Stockholm. 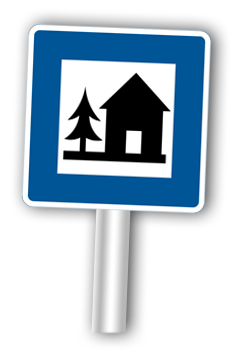 Turn right at Partille C/Landvetter and follow the international sign for hostel for about 3 km, turn left. From E20 north from Örebro, Alingsås etc:Turn right at the exit Partille C/Landvetter and see above. From road 40 from Jönköping/Borås: Next exit to the right after Gothenburg Landvetter Airport to Landvetter C/Partille C, direction Partille C. Just after “Furulund” you find the international sign for hostel- turn right. Bus 503, 513 and 516 leaves every half an hour in both directions. The Bus stop is Åstebo. Partille Family Hostel On Facebook!